Today we announced the addition of sustainable brand, JUST Water to our beverage portfolio. With 82% renewable packaging, the brand’s entry into the UK comes after rapid growth in the US, with JUST Water becoming the number one selling branded Bottled Water in its category at Whole Foods Market, since it launched in 2015. The JUST Water bottle is made from sugarcane to make the bio-plastic of the cap and shoulders of the carton; and trees from sustainably managed forests to create the paper that makes the carton. In total, 82% of the materials in the package come from plant-based renewable resources, which leads to a positive carbon impact on the environment. The water itself is still spring water from a sustainable source and bottled locally in the UK. Alongside this, JUST Water is working to cut greenhouse and CO2 emissions through recycling waste, cutting travel and supporting sustainable forests. The product is the brainchild of Jaden Smith, son of Hollywood actor Will Smith, who from an early age took an interest in reducing the amount of plastic in the ocean. JUST Water packaging is recyclable in nine out of ten UK communities where kerbside or bring bank collecting is available, and is comprised of 82% renewable resources, ensuring the minimal impact on the environment. 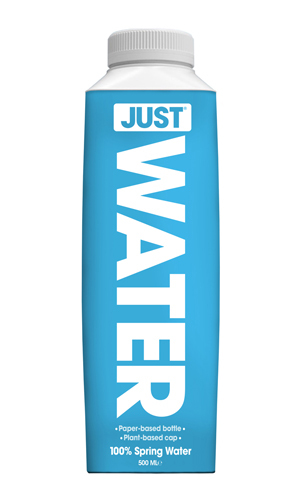 JUST Water will retail at £1.29 and is available in 800 Boots stores nationwide and all Whole Foods Market locations in the UK.